Better Courtesy Delivery Experience, Enhanced Visibility: Agent Central eDraft is Here! Many fleet professionals depend on courtesy deliveries to keep their fleet running. Interruptions and delays in that delivery process could mean the difference between whether a driver is able to hit the road and do their job, which ultimately impacts your bottom line. We get it. That’s why we’ve released Agent Central eDraft, which gives courtesy delivery dealers access to comprehensive data, allowing them to better prepare for vehicle delivery, and in turn get vehicles to drivers faster. Agent Central eDraft sends a notification to the dealership the moment a vehicle is assigned to them, providing them with the information they need immediately. With this information in hand, dealers can plan appropriately based on expected delivery and ultimately decrease the time it takes for them to get vehicles delivered to drivers. In addition to providing dealers with more information, we are also able to capture more information from dealers for the benefit of our customers. We are requesting that dealers submit plate information (including temporary tags) along with plate delivery method, delivery confirmations, vehicle turn-in conformations, and other key details on the draft. All of this information is now available to fleet managers in a Draft Detail Summary built within our Vehicle Information Center (VIC), our one-stop shop for all vehicle details, and accessed via our award-winning fleet management platform, FleetWeb®. A very common issue for fleets is managing the expiration dates of all of the temporary tags within their fleet. At the time of writing, with Agent Central eDraft, Donlen is the only fleet management company to track temporary tag information, preventing your drivers from having expired tags. Agent Central captures whether or not a vehicle was issued a temporary tag, and if so, the temp tag number and the expiration date to ensure our customers’ vehicles remain operational. When a temporary tag is nearing expiration, Agent Central eDraft notifies the dealer to take action. This way fleet managers and drivers can avoid the potential headache of expiring temporary tags. All of these improvements for our customers are driven by the improved visibility available to courtesy dealers in Donlen’s network through Agent Central. The real-time data dealers receive via Agent Central allows them to accurately track the status of incoming orders, and contains detailed instructions for the dealership to follow prior to releasing vehicles to drivers. The detailed information that Donlen’s electronic draft portal provides to dealers includes when the vehicle is expected to arrive at their location, special delivery instructions (if applicable), and dealer-installed items that are needed and instructions on how to install those items (if applicable). In addition, courtesy delivery dealers receive OEM data such as MSO details, plates and other compliance information. Our goal with Agent Central eDraft was to improve the delivery process for everyone. While developing the system, we worked with dealers to ensure we provide them with valuable information to assist them in streamlining their delivery processes. “As a dealer who has been in this industry for 17 years, Donlen’s dealer web version of the portal sets the bar high from their competition because it is effortless and painless!” said Wendy Schaeffer, executive administrator at Boucher Fleet Group. With Agent Central eDraft we’ve improved the courtesy delivery experience for our customers and streamlined the delivery process for our dealer network with enhanced visibility. Everybody wins! 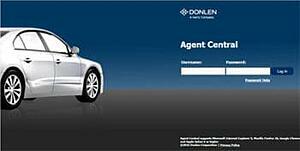 Want to learn more about Donlen's vehicle acquisition services, including Agent Central eDraft? Are you a dealership with questions about Agent Central? Please email us at dealerinfo@donlen.com.